Of course what we all want to do at the Living Boat Trust is get 'on the water', and we do it all the time. On a casual basis members take out our Grebe dinghies for a row or a sail around Egg Island or down the river. The 'Women on the Water (WOW)' have an organised program and traditionally meet to go rowing on Friday mornings. 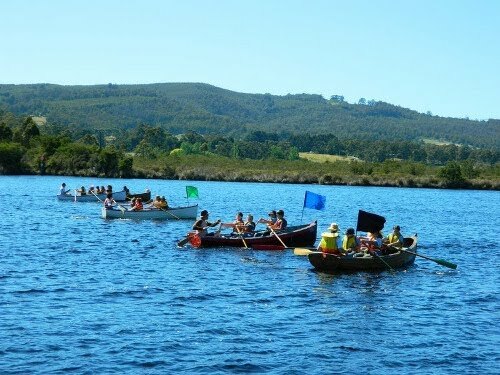 There are expeditions and regattas and excursions organised on a regular basis - watch the news column. The photo at left shows the start of a dinghy race at the Swiftsure regatta - the annual culmination of 'On the Water'. See the Swiftsure Regatta 2014 page.